Hello, My Name is Martin Heron. Welcome to Martin's Driving School in Plymouth. Completed The Tri Coaching Accelarate Course in Coaching Techniques. I am a Member of The Buy with Confidence' Approved Trader Scheme' and been Vetted and Approved by Plymouth City Council Trading Standards to ensure that I operate in a Legal, Honest and Fair Way. I have also Been Checked and Cleared By The CRB (Criminal Records Bureau). My own standards of instruction and knowledge, are regularly inspected by the DVSA to ensure that my pupils are given correct and professional tuition at all times. I am Passionate about Road Safety and My aim is to teach you to a very high standard to become a safe driver, with confidence and competency, to enable you to pass your driving test, and to continue this when you are successfull. You are the customer, so your training will be structured to suit your needs. Please feel free and continue to browse this site. Contact me with any questions. 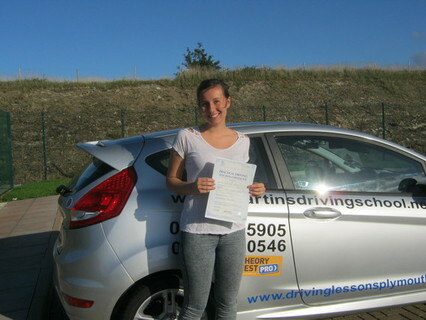 Free On-Line Training with Driver Active and Theory Test Pro when You book with Martin's Driving School in Plymouth! Blue Light Aware....Response to Emergency Vehicles. Lost Your Theory Certificate Number? PROTYRE....Won't Be Beaten on Price! Plymouth 01752 228118. Tamar Couriers....Plymouth 01752 848333...For All Your Transport Needs! COME ON.....Chloe didn't hang around, so what are you waiting for?